Club General Manager, Gavin Deane and Marina & Racing Manager, Mark Ring recently attended a number of special meetings in Derry bringing together project partners from across the globe involved in the promotion of Slow Adventure experiences, through the SAINT (Slow Adventure in Northern Territories) and COOL Route tourism initiatives. The project has eleven partners across seven countries all working to develop new visitor experiences which will result in the creation of a transnational Slow Adventure Brand. The programme is led locally by Derry City and Strabane District Council, and is a Northern Periphery and Arctic Project, funded under the Interreg IVB NPA Programme. Mayor of Derry City and Strabane District Alderman Hilary McClintock, said the Slow Adventure concept had particular relevance for local companies. “Both the SAINT and Cool Route projects are innovative and exciting in their approaches, and have a wealth of experience to pass on to local businesses. This partnership approach to tourism offers the opportunity to learn from examples of best practice and new ideas based on the first hand experiences of companies from around the world. The SAINT project has eleven partners across seven countries, all working to extend the marketing reach of businesses in the slow adventure tourism sector. The aim is to encourage more tourists to come to the areas to enjoy and experience the outdoors and engage with remote, wild and nature-rich places. Meanwhile the COOL Routes scheme – Cruising Oceans on Latitudes above 51 Degrees North – aims to investigate all aspects of the practical logistics and business potential of establishing a bi-directional yacht cruising route along the western offshore areas of the Northern Periphery Area. Project Officer with Derry and Strabane Council, Jennifer O’Donnell, said the meetings had been extremely productive in terms of reaffirming links with a number of exciting tourism destinations. 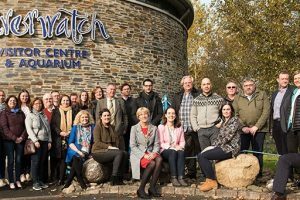 “We are delighted to be working in partnership with such a wide range of destinations, with representatives from Scotland, Sweden, Finland, Norway all here to share their research and experience,” she explained. Over the coming months the partners will continue working on opportunities around project collaboration and maximising the business opportunities for SME’s in the region around Slow Adventure and Marine Tourism.